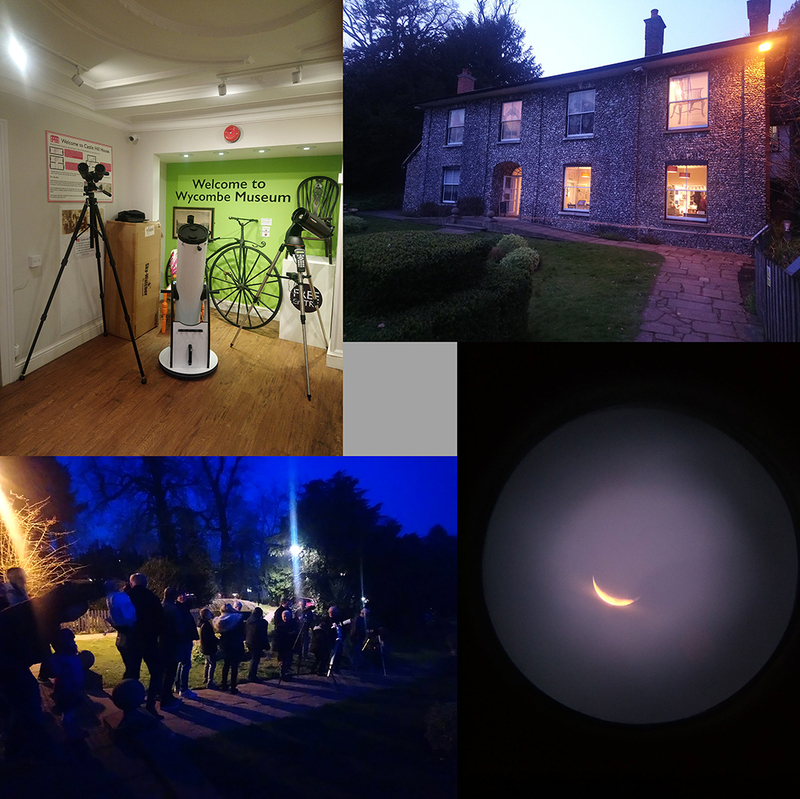 Bearing in mind it snowed last time we did an outreach event at Wycombe Museum, we were extraordinarily lucky this time – our guests actually saw something! 52 guests, about half of them youngsters, enjoyed a dinner whilst listening to a presentation from Sandy Giles about the 1969 Apollo 11 lunar landing mission and about the Moon. The cloudy weather showed little sign of clearing so Gary Taylor, Paul Phillips and Brian Greenow prepared to set up their scopes in the Museum buildings for a show-and-tell session. But just as Sandy was finishing his presentation the sky semi-cleared, sufficient that at least the Moon could be observed through scopes. Hastily the scopes were re-positioned outside and our guests quickly lined up to catch it before the clouds returned. Everyone enjoyed the evening, several guests were keen to come along to our meetings and a number expressed an interest in actually buying a telescope. Wycombe Sound Radio also attended the event and Brian and a couple of the guests gave interviews. As we packed up, the clouds returned – it even started to rain. However, it was a very successful outreach event (we’ve been invited back for another Stargazing Evening on 16th November 2019). But we really were lucky!